Mahendra Singh Dhoni be awarded the honorary rank of Lt Colonel. Jharkhand Chief Minister Arjun Munda on Wednesday recommended to the defence ministry that local lad and Indian cricket captain Mahendra Singh Dhoni be awarded the honorary rank of Lt Colonel. "Munda has written a letter to the defence ministry recommending award of honorary rank of Lt Colonel to Dhoni," an official of the Chief Minister's Office (CMO) said. After India won the cricket World Cup after 28 years, the Jharkhand government announced it would provide five acres of land to Dhoni to set up a cricket academy. 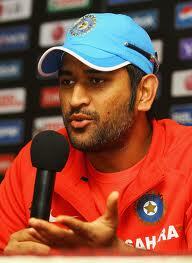 Dhoni has also been made brand ambassador of the state's forest and environment department. The state government had gifted 4,000 sq feet land to Dhoni in Ranchi when he started playing world cricket in 2005.